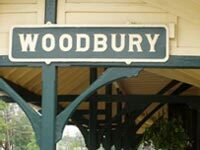 Located seven miles from Center City Philadelphia, Woodbury, New Jersey is the central business district of Gloucester County's metropolitan area with over 25,000 cars passing through each day. Route 45 is the main street and the backbone of historic downtown Woodbury. Woodbury is the historic hub of Gloucester County. This road reduction is the third project of its kind to be initiated by NJDOT. 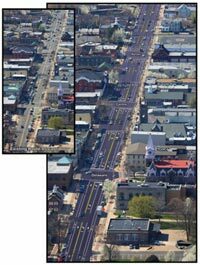 When implemented, these changes will provide a pedestrian and bicycle-friendly road through downtown Woodbury. The narrower streets will slow traffic and give greater visibility to downtown businesses. This study has advanced to the design stage and concept recommendations from the study will be will be translated into actual engineering designs. under the road diet (inset).